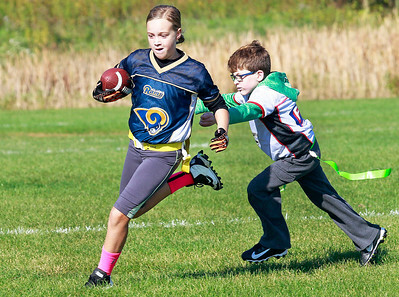 Candace H. Johnson-For Shaw Media St. Louis Rams Katelyn Marcelain, 9, of Round Lake runs the ball against Atlanta Falcons Brady Scruton, 9, of Grayslake during their Round Lake Youth Flag Football League game at the Round Lake Sports Center in Round Lake Beach. 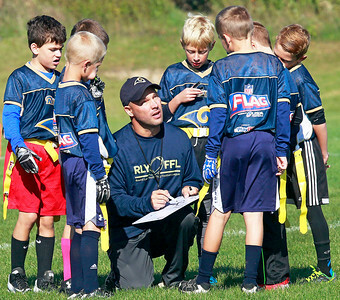 Candace H. Johnson-For Shaw Media St. Louis Rams Coach Eric Carlson, of Round Lake talks with his team during their Round Lake Youth Flag Football League game against the Atlanta Falcons at the Round Lake Sports Center in Round Lake Beach. 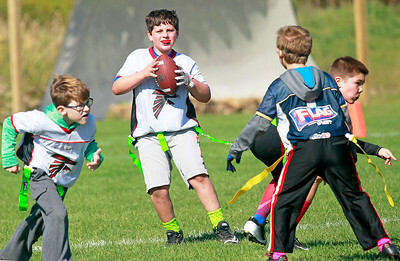 Candace H. Johnson-For Shaw Media Atlanta Falcons Beckham Stone, 8, of Round Lake looks to pass against the St. Louis Rams during their Round Lake Youth Flag Football League game at the Round Lake Sports Center in Round Lake Beach. 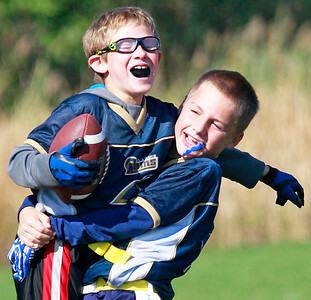 Candace H. Johnson-For Shaw Media St. Louis Rams Brady Scruton, 9, of Grayslake celebrates with Brady Carlson, 9, of Round Lake during their Round Lake Youth Flag Football League game against the Atlanta Falcons at the Round Lake Sports Center in Round Lake Beach. 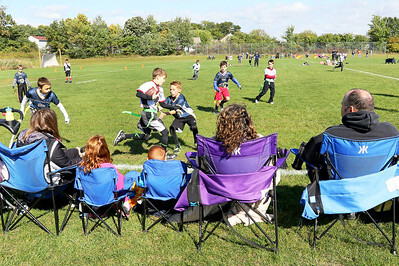 Candace H. Johnson-For Shaw Media Families watch the Atlanta Falcons play the St. Louis Rams during a Round Lake Youth Flag Football League game at the Round Lake Sports Center in Round Lake Beach. 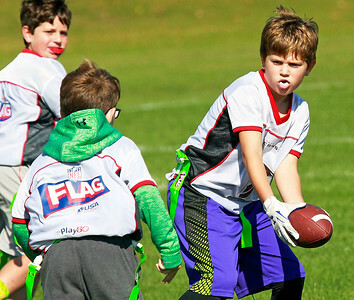 Candace H. Johnson-For Shaw Media Atlanta Falcons Ryan Herndon, 10, of Round Lake (on right) fakes a handoff to Aidan Eisenberg, 8, of Hainesville against the St. Louis Rams during a Round Lake Youth Flag Football League game at the Round Lake Sports Center in Round Lake Beach. 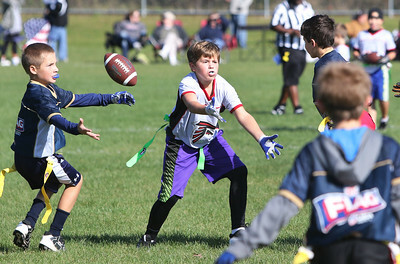 Candace H. Johnson-For Shaw Media St. Louis Rams Brady Carlson, 9, looks to catch a ball intended for Atlanta Falcons Ryan Herndon, 10, both of Round Lake during their Round Lake Youth Flag Football League game at the Round Lake Sports Center in Round Lake Beach. 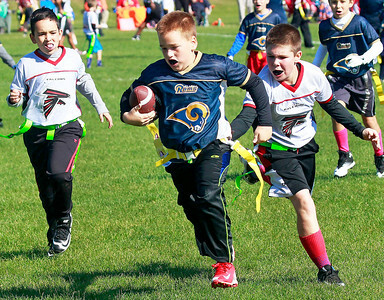 Candace H. Johnson-For Shaw Media St. Louis Rams Nolan Marcelain, 8, looks to escape Atlanta Falcons Daniel Delboccio, 10, both of Round Lake, as he runs the ball during their Round Lake Youth Flag Football League game at the Round Lake Sports Center in Round Lake Beach. 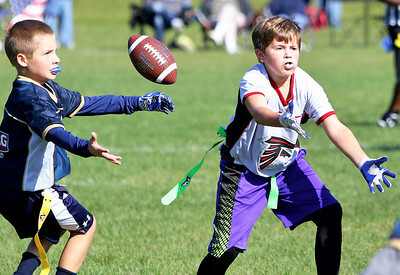 Atlanta Falcons Ryan Herndon, 10, of Round Lake (on right) fakes a handoff to Aidan Eisenberg, 8, of Hainesville against the St. Louis Rams during a Round Lake Youth Flag Football League game at the Round Lake Sports Center in Round Lake Beach.